ROBOSINGHO ARACHICHILAGE DON SUGATH THILAKARATNE. No one can deny that a name such as this is Trubo-Charged! It belongs proudly to that little known guy from tiny Sri Lanka who had the memorable unforgettable moment of pushing the brilliant American power house MICHAEL JOHNSON into second place and winning the 200 metre heats event. Johnson was AMERICA’ S sensational 200 and 400 metre track athlete with powers of that indefinable thing called Black Magic. He was rightly tagged MICHAEL ‘MAGIC’ JOHNSON who scorched the tracks be it the Olympic Games, World Championships or any other athletic meet. Records came flooding to this wonder athlete and his style, grace and the getting off the blocks like a bullet, was a bullet in motion, stunned the audience watching him and his easy breezing to the tape first for him was all in a day’s work. Then came that bolt of lightning named Usain Bolt from Jamaica a little known island in the Caribbean to beat all opposition and hug the 100 and 200 metre records for many years. But believe it or not a Sri Lankan athlete who was a promising 400 metre champion who could have joined the world’s athletic elite if he had the necessary coaching and training facilities had the memorable unforgettable moment of pushing the brilliant JOHNSON into second place and winning the 200 metre heats event Yes, that distinction belonged to ROBOSINGHO ARACHICHILAGE DON SUGATH THILAKARATNE. It happened this way and in unbelievable and fortuitous circumstances. The writer takes you back to that cool and balmy day in Atlanta, USA in 1966 and to a preliminary heat of the 400 metre event. Facing the starter THILAKARATNE’S moment of glory and fame came when he won the first round with a fantastic timing of 44.78 seconds putting to second the man who all thought was invincible MICHAEL JOHNSON of USA who returned a time of 45.89 secs. True, the achievement of this little Lankan was not taken notice of, with the event being only a heat, but heat or whatever the fact remains and will be etched in the books as a superlative effort by the Lankan from the tear drop island in the Indian Ocean. An effort that will never ever be equaled or surpassed. THILAKARATNE had an easy style of running. Although not having the good fortune of being shown how and trained by the elite coaches that the Colombo athletes are fortunate and blessed with, TILLEKERATNE can be best described as a self made champion athlete who was an example to all budding Lanka athletes. After showing early promise on the track as a fledgeling athlete and then making his appearance rubbing shoulders with his Colombo counterparts who were better trained. But he showed he was as good or even better than them. The year that will always be etched in his memory. It was 1993. The unassuming, shy yet determined village lad who first got on to a athletic track from Norton Bridge enjoyed his golden year on the local track when he was penciled to run in the South Asian Games trials where he created the first of his many records to follow with a new Ceylon record in the 400 metres with a timing of 47.17 seconds. 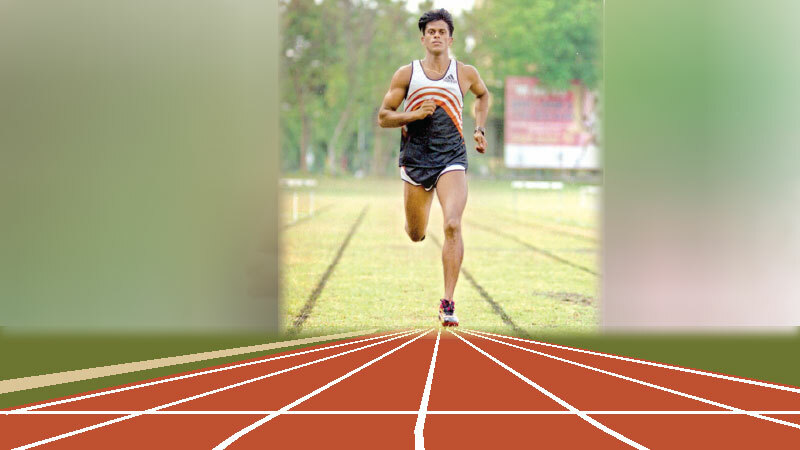 That was the stepping stone for running in the SAF Games where he pocketed six gold medals. Then running in big time meets hobnobbing with and watching the cream of world athletes was in 1993 when he ran in the country’s colours at two Olympic Games in 1996 in Atlanta and 2000 in Sydney, Australia. THILKARATNE was an athlete who none could match. He was like dynamite when off the blocks. He was blessed in having a dream start with the crack of the starter’s pistol and would career down the track like a sleek limo jaguar on the track. He never took things easy in life or the athletic track. He continued to train come sun or rain and he was perseverance personified and an example to all athletes watching his tremendous training schedule, which strict regimen which other mortals would have lost resolve been frustrated and forced to quit. THILAKARATNE had the distinction of appearing in addition to the Atlanta and Sydney Olympics also in four World Championship Games in Greece 1997, Spain 1999, Edmonton 2001 ad France 2003. BUT an event that that he won that is still vivid in his memory came in 1998 in the country of cherry blossoms – Japan – in 1998 when he won the bronze medal at the Asian Championships with a timing of 44.61 seconds in the 400 metres which was also declared as a meet record. THILAKARTNE emerged from a little known hamlet from the famous Norton Bridge in Nuwara Eliya and was born on July 30, 1973 to R.A. Appuhamy and M.G.R Lisinona who were blessed with four sons - R.A. Ariyachandra, R.A. Wickremaweera, R.A.Nihal Jayaratne, Sugath Thillakaratne and daughter Suneetha Chandrakanthi. THILAKARTNE as a young kid started schooling at Vidilipura Maha Vidyalaya and the only popular sport at school was athletics and at first day at school seeing the athletes in action, he stood still and watched them perform and in inner self he had probably vowed to not only emulate them but, stun the school, the club and the country he would run for with his talent. THILAKARATNE is still grateful to two sports teachers – Jayalath Senaka Premawansa and Padmawathi for showing him how. THILAKARTNE showed natural ability doing the 50, 75, 100 and 200 metres.. But luck came his way when a talented athletic coach at Ambagamuwa Maha Vidyalaya Anura Bandara saw in the youngster unlimited talent in 400 metre running and got him to specialize in that event. He believed in his new coach and continued to train hard and rich dividends came his way when in the 1993 Nuwara Eliya District Meet he breasted the tape first in the new event and that victory propelled him to success in the All-Island Schools Athletic Championships with a 400 metre record of 48.50 seconds and from then on it was ELDORADO.